The rule is the same as the solitaire of Windows. 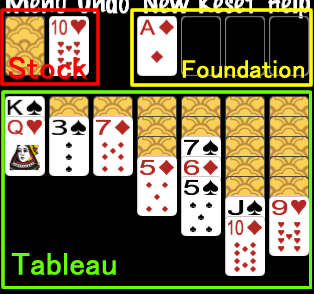 The card of the same mark as order is marking clear in Foundation from 1 to 13 of all when finishing arranging it. The card with different color of a mark small by one of Tableau can be put forward. The card that can be moved is a card on and a card that Tableau turned over of turning over from Stock. Moreover, only 13 can be put on Tableau that becomes empty.